Today went pretty well. My skin is looking really good, and since the aim of this whole cleanse is to heal this weird rash around my nose and rebalance my gut flora, I'm happy about that. I am so glad I don't care about being strict with "cleanses" anymore. I remember a few years ago when I did a 10-day juice fast (you can find it on my blog) and I was crazy restrictive. I think a motivation for doing that juice fast had remnants of my disordered eating from the past, but this time there's none of that. I am not doing this to lose weight or any other sh*tty reason that doesn't matter. I am doing it to feel good. When you aren't in the "I-am-on-a-juice-fast-so-eating-a-few-organic-strawberries-will-ruin-everything" mindset, cleansing is hella fun! Jack and I are drinking juices all day and then having veggie broth for dinner. but throughout the day I'm also enjoying other foods like almond yogurt, chia seed pudding, fresh fruit and banana ice cream. Plus we add seaweed and garlic chunks to the vegetable broth we have in the evening so it seriously hits the SPOT after a day of cold/coolish eating. If you're doing this cleanse with us, or even trying some of the recipes, or honestly have anything to say - let me know in the comment section! :) Until tomorrow; *HUG*. Juice it. Drink it. Mmm. Throw the chia seeds into the water and let them puff up for about an hour. Add to the yogurt along with the strawberries and enjoy! Use a natural sweetener if you want. Simmer the broth then add everything and eat. I just finished a 30 day juice cleanse & feel amazing! I'm trying out your recipes for my week & a half of vegan. I'll let you know what our favorites are! Thanks so much for inspiring & sharing! Very interesting, thanks for sharing this journey. I haven't tried a juice cleanse yet, but I'm curious. The recipes sound great. Juices are so delicious!! I love smoothie bowls too! Anyways, it's so important to NOT be restrictive at all! It just messes us up! 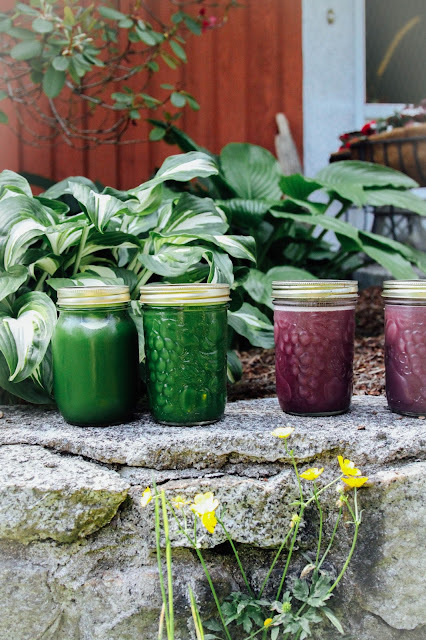 These juices sound amazing! Quick question though- where do you get unpasteurized almond yogurt? Did you buy it or make it yourself? Quick question- where do you get unpasteurized almond yogurt? Were you able to buy it somewhere or did you make it yourself?